At the 2007 Boy Scouts of America meeting in Atlanta, Georgia, Vito J. Gautieri, Chairman and CEO of V.J. Gautieri Constructors, Inc., was named President of Area 3 for the Northeast Region. Area 3 consists of 12 Councils which have over 45,000 registered youths. His efforts made national news this year in both the Northeaster, a publication of the Northeast region of Boy Scouts of America, and National Italian American Foundation News. "This is a boon to us; we certainly couldn't afford to rent both the Lockport and Batavia sites. Locally we're doing very well, we have a great participation in year round programs," Jim McMullen (Iroquois Scout Executive) said. "Lockport is not central to our geography. We serve Niagara, Orleans, Genesee, Wyoming and Livingston counties. We have 4,000 youth. ""I look at it not as a gift, but as an investment for the future of Scouting in our area." Vito said. Genesee County ARC, A Chapter of NYSARC, Inc. The Gautieri Family has been active in contributions and fundraising events for many years and at the request of Sandy Konfederath from ARC, are proudly being added to this page. Notre Dame High School The Gautieri Family has long been active in the ND Annual Golf, Tennis and Bocce Tournament. Vito, an avid tennis player, has competed for many years. The past few years his children (Valerie, V.J. and his wife Lisa) and niece and nephew (Vicki Gautieri Johnson and Bill Metz) have played Bocce in honor of Vito’s brother, Vinny Gautieri. Girl Scouts of Genesee Valley, Inc. Program Manager, Kathie Woika, received a “Build-up” Kit for use in their program this year. Donated by VJ Gautieri Constructors, the kit will supply 30 girls with activities and crafts related to the building and construction fields. 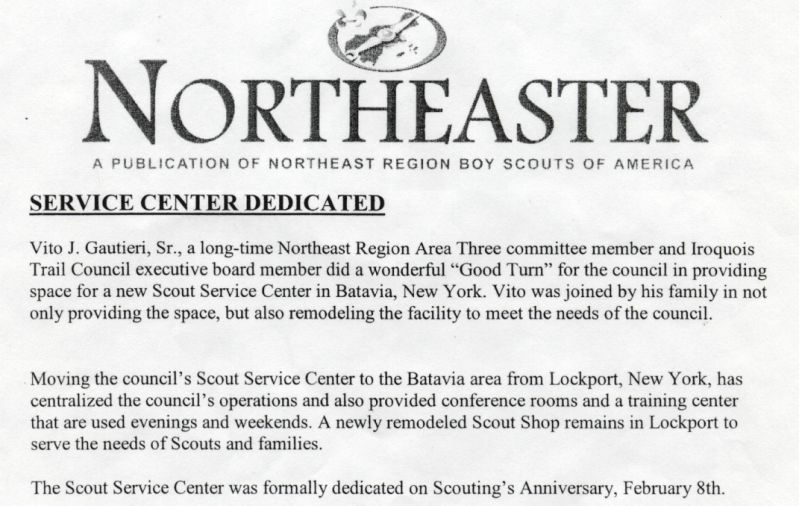 The Cub Scouts Troop 60 in Attica, NY is also a beneficiary of the Gautieri family’s gifts of time and money. 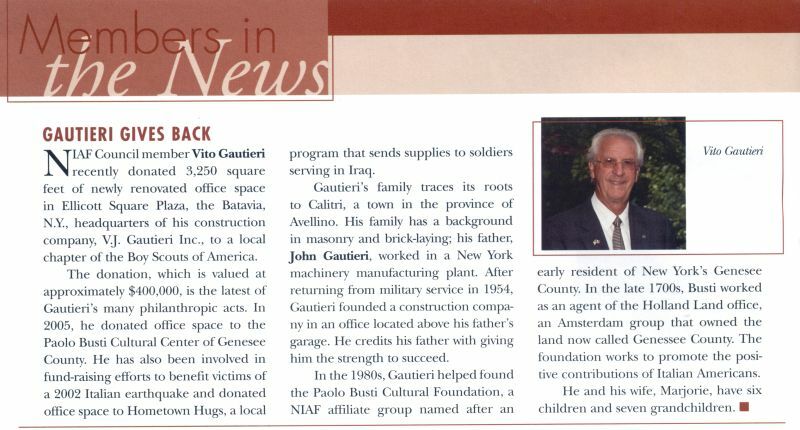 Victor Gautieri, President of VJ Gautieri Constructors, is a dedicated volunteer with the Pack for over a decade. Victor is active with the committee, Fund raising events, the popcorn drives and the Pinewood Derby, dedicating countless hours of time each year. The Paolo Busti Cultural foundation of Genesee County is an affiliate group of NIAF (National Italian American Foundation). As one of the founding members and a past President, Vito Gautieri has been involved with this group since 1984. The group works to promote the positive contributions of Italian Americans. One of the biggest events for the foundation is the Annual Scholarships. Thousands of dollars are given yearly to deserving high school seniors bound for college. The Genesee Community College Foundation has had a Board Member and advocate in Vito Gautieri for many years. He was President the year $1.5 Million was raised to build the new Technology Center. His Construction and Business Experience have been an advantage to the foundation and the community it services.